Every so often, we feature common small business mistakes, so you can learn from them. Lots of small business make a mistake in setting and keeping their business hours. 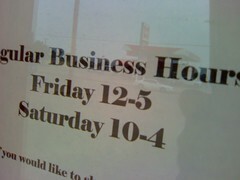 Here’s an example from a retail business, open only 11 hours per week. But hey, they do say you can call and they’ll come open up. This may be more common in small towns, where we’re more informal. It’s still a mistake. How many potential customers are you turning away? Two years ago, I wrote about a couple of other local business, one with inconsistent hours that were always changing and one that wasn’t always open when it said it would be. The tips on setting business hours that I offered in 2007 are just as good today. Think about your target customers when you set your hours. Ask them when they want you to be open. Set an incredibly easy to understand schedule. Publicize your business hours in all the media you use. Be open when you say you will. Open on time, and don’t close early. I know, emergencies will occur, but do your best! This has really annoyed me lately. I really want to shop local, but I guess I’ve been conditioned by box store accessibility. Seemingly random closures really hurt business. Have you seen this “store hours” poster I posted to TwitPic a couple weeks ago? Marc, that is a excellent point. Inconvenient hours hurt our efforts at shop local. Marc, that is an oldie but a goodie! And it’s a perfect companion to this post. Thanks! As you know, I focus on rural tourism related businesses. In August I ran a post tackling this question for tourism at http://ruraltourismmarketing.com/2009/08/setting-retail-hours-in-tourism-towns/. I recently got a request from two local first organizations for a more general post for ALL small town businesses. You’ve saved me the effort. I’ll pass on this post! Great article, Joanne! Thanks for sharing it. You know we are big fans of your stuff around here.